40 Waist - £81.99 Only 3 left! 42 - £81.99 Only 3 left! 44 - £81.99 Only 4 left! 46 - £81.99 Only 1 left! Remember the days when people used to meet in person before they went on a date. Meet cutes could happen anywhere. In a book shop, while boogying in the streets, even while picking up an embarrassing amount of ice cream (for you and your many friends waiting at home). In today's world of endless varieties of dating apps, your thumb can get tired of swiping. Plus, how many selfies can you really look at in one day? Wouldn't it be great to go out in the world in something that says, "Look at me! I'm ready for love! Let's meet cute."? It's about time you took your place on what we must assume is a velvet throne lined with glowing neon red lights, the throne of the king of hearts. 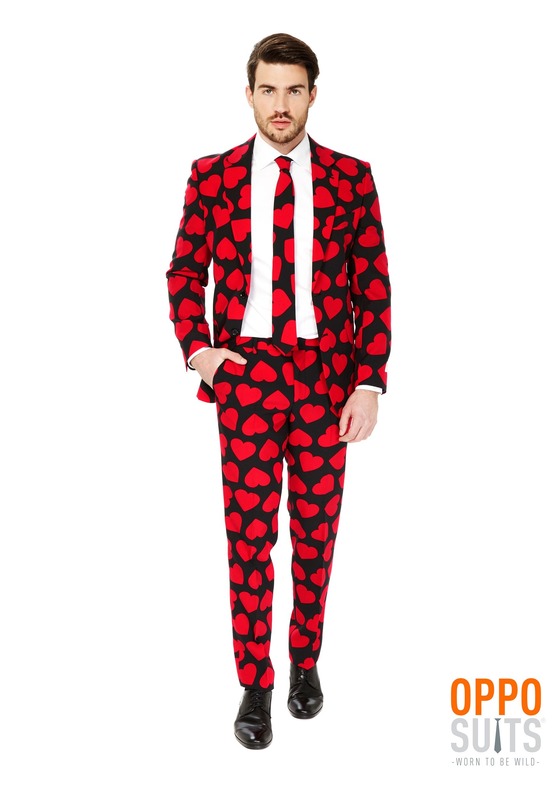 Yes, there's no need for you to make the first move or check your app when you're wearing this stunning suit. 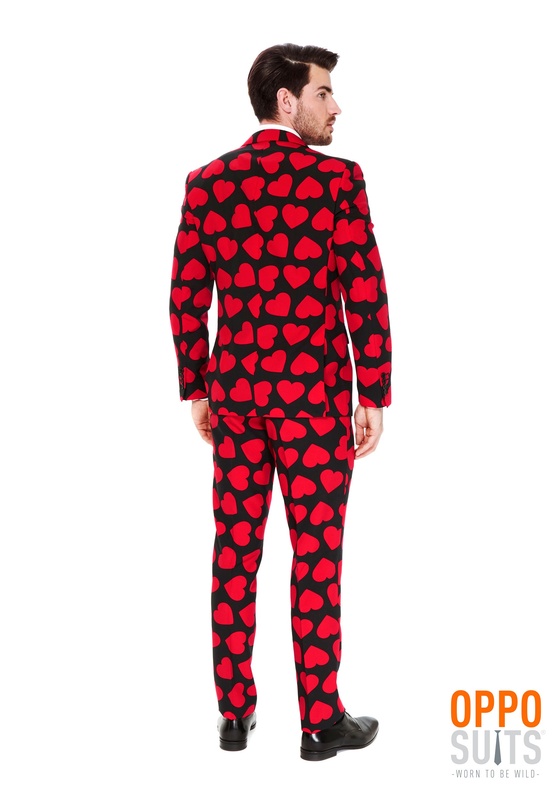 It has a classic black back ground, a classic cut, and is bursting with a red heart pattern. All those people hunched over their drinks waiting for that Tinder date who may or may not show up will feel their hearts lift in hope when you walk in the door. Whether or not you're interested in those poor passive, non-heart suit wearing people, it is you, brave soul, that is delivering that hope in this cold technological age. 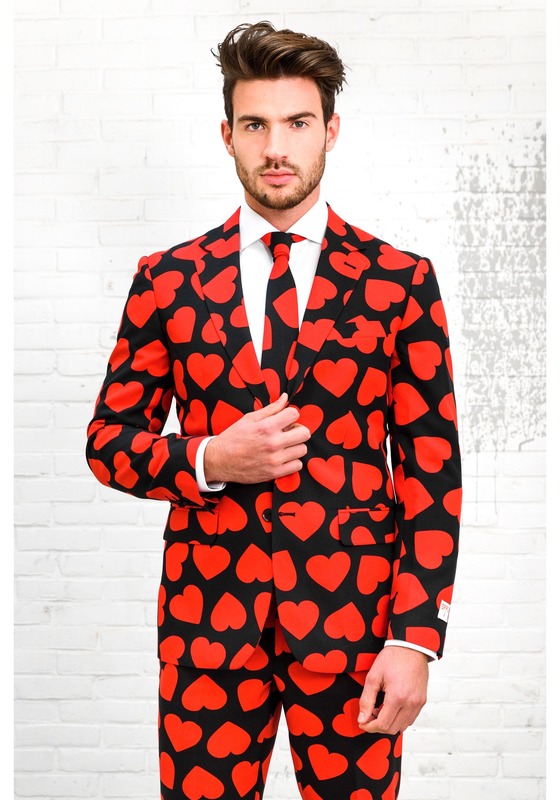 So, whether you're wearing this to your first date or re-wearing it to your blessed nuptials (because really, who could not fall in love with a guy wearing a heart suit?) you're sure to make a great impression to everyone present. Forget Cupid, you've got this one covered!